Amid the turmoil after her father’s death – family decision to be made, the future of their farm to be settled – Jane Brox begins a search for her family’s story. The search soon leads her to the fascinating and quintessentially American history of New England’s Merrimack Valley, its farmers, and the immigrant workers caught up in the industrial textile age. 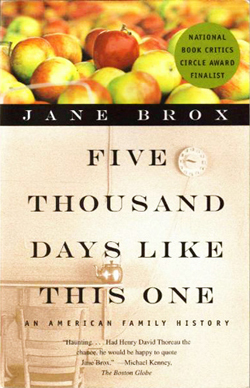 At the center of Brox’s journey through family history is a poignant question: How can her own family identity – language, food, a grandfather’s wish for “five thousand days like this one” – be recovered when so few traces of former lives are left? When Five Thousand Days Like This One returns to the present, along with decision on how the orchards and farm stand will or won’t change, the author must make her own discoveries about those aspects of family identity she can cherish and those she must let go.